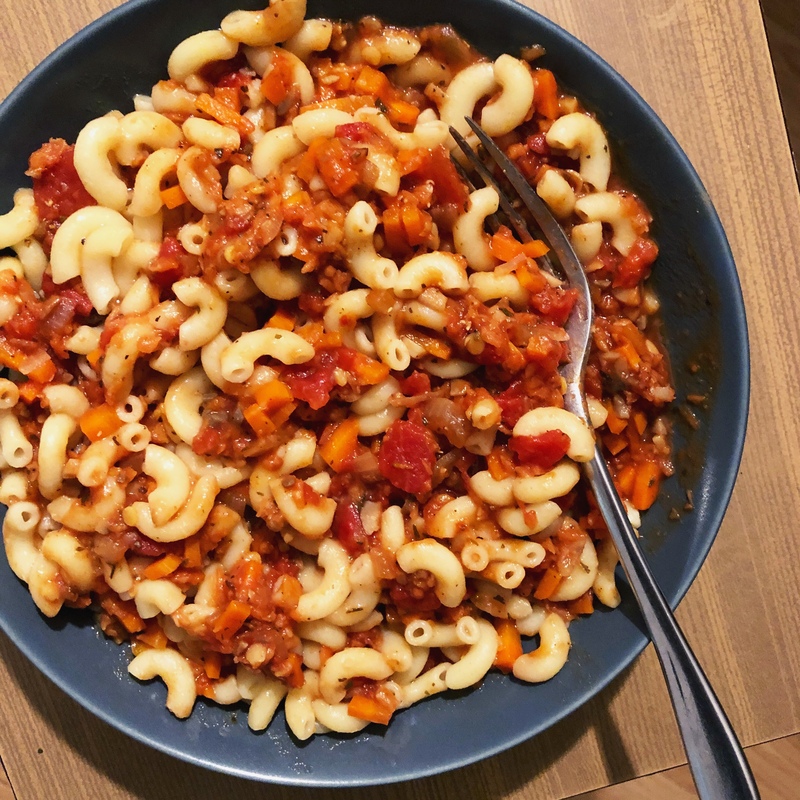 Bolognese sauce is typically meat-based but we veganised it by replacing the meat with red lentils. This recipe is inspired by Vegan Richa’s recipe so be sure to check out her blog as well. Lentils, where have you been all my life? I’ve never been a huge fan of lentils simply because I’ve never cooked with them. Black beans or chickpeas are more my speed but lately, I’m expanding my horizons since we can find them in bulk bins. Dried lentils from bulk bins means less waste so now I prefer them over canned beans or dried beans sold in plastic packaging. I’m probably the last vegan ever to realise this, but lentils are delicious and so easy to cook! Red lentils are my favourite so far because they cook quickly unlike brown or green lentils. We use red lentils in this bolognese recipe but last week we made THE BEST veggie burgers using brown lentils. Brown lentils are tasty but need to be cooked for longer—around 45 minutes. Anyways, back to the bolognese! 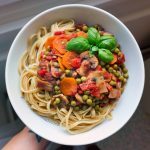 This sauce was easy to make, super tasty, and even looks like the “real” thing! 😉 The texture was spot on thanks to the finely chopped veggies and red lentils. I’m already looking forward to making it again. Serve this hearty sauce over your favourite pasta, rice, or potatoes. Rinse and drain the lentils and add to a small pot with 2 cups of water. Bring to a boil and simmer for 5-8 minutes until soft. It will be soupy but that’s okay. You’ll use this liquid later. Set aside. Heat 1/2 cup of water (or veggie broth) in a large pot over high heat. Once it steams, add onion and mushroom. Cook for 5 minutes until onions are translucent. Stir occasionally. Add the carrots, dried herbs, veggie broth powder, black pepper and mix. Add in several spoonfuls of lentil broth (or use veggie broth or water) and cook for 2 mins. Add the diced tomatoes and tomato paste. Bring to a boil and simmer for 10 minutes. Lower the heat if so it maintains a simmer (and doesn't boil too hard). Stir in the cooked lentils and cook for a couple minutes. Cover and remove from the heat. Let it sit for a few minutes before serving over your favourite pasta. Try this recipe with other types of lentils, chickpeas, or split peas. Add some fresh garlic or dried when sautéing the onions and mushrooms. Dary Natury makes my favourite veggie broth powder. It's oil-free, low in salt and tastes great! If you don’t have veggie broth powder, you can skip it or use veggie broth in this recipe instead of water. Serve over couscous, rice, or potatoes if you want to skip the pasta. « Plastic-Free Breakfast For The Win! What I love about your recipes is that they’re easy to make and easy to make substitutions if i don’t have the exact ingredients on hand. They’re kinda minimalist like you. I’m looking forward to trying this one. Cheers.